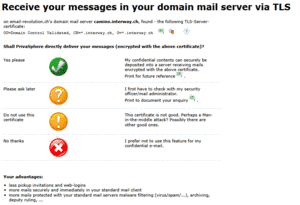 Many users prefer to use their standard e-mail program for sending and receiving secure messages. Therefore PrivaSphere Secure Messaging can be integrated into your standard e-mail user interface by the configuring of an additional e-mail account. The user then can choose between the appropriate transmission channels - PrivaSphere Secure Messaging for messages containing personal or confidential information. 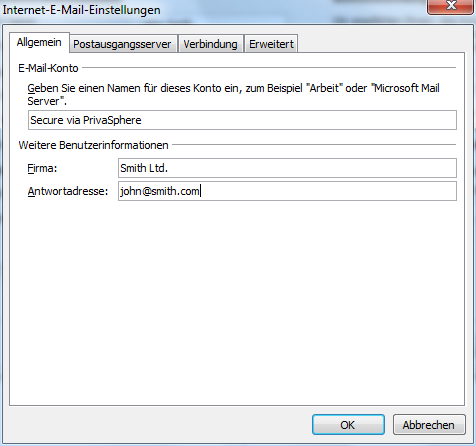 Enter incoming mail server (POP3): pop.privasphere.com . Enter your PrivaSphere account login (=e-mail address) as "User Name"
Enter your PrivaSphere password as "Password"
Do NOT click on "Test Account Settings" - it will not succeed since PrivaSphere only accepts encrypted connections that will be configured next and it might disclose your PrivaSphere password such you will have to change it immediately thereafter! Outgoing Server: check the box for "My outgoing server (SMTP) requires authentication"
"Incoming server (POP3): 995", check the box for "This server requires an encrypted connection (SSL)"
"Outgoing Server (SMTP): 25", check the box for "This server requires an encrypted connection (SSL)"
If your mail program supports not just SSL, but also TLS, then choose TLS. (E.g. 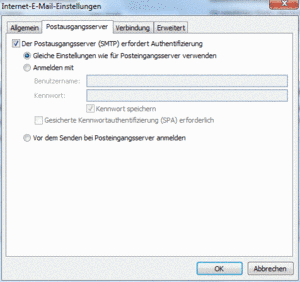 Mozilla Thunderbird 1.0 offers this and choosing SSL will change your port to the legacy port 465 instead of 25. 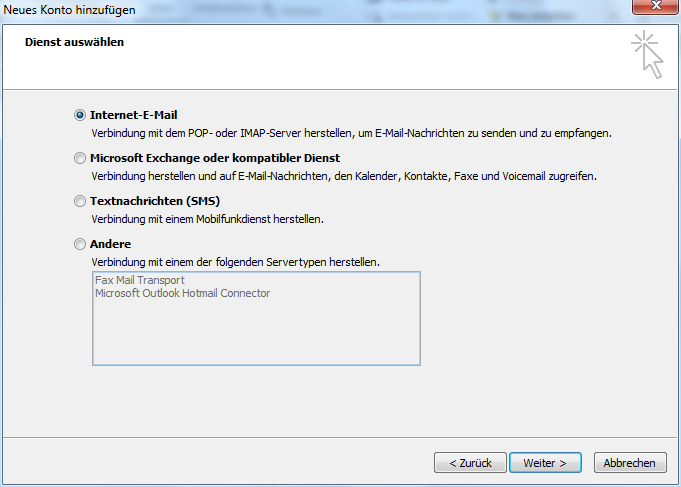 )For example with Lotus Notes, choose the legacy port 465 - it will not work with port 25, i.e. with "STARTTLS". This finishes your configuration.Hint: Anti virus software installed on your computer system may interfere with sending secure emails (Symantec Norton, McAfee, etc.). 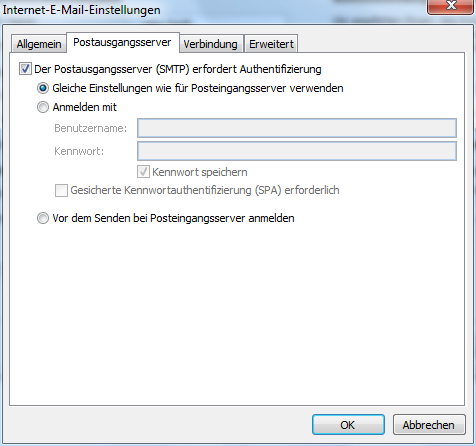 Use Port 465 for the outgoing server (SMTP) instead of port 25 in this case.. If you prefer not to configure your mail program yourself, then contact a PrivaSphere representative or partner for additional assistance. Professional users working from a locked corporate desktop or rigidly closed outbound firewalls might need their IT department to enable the mail account configuration option. Contact a PrivaSphere representative for additional assistance. 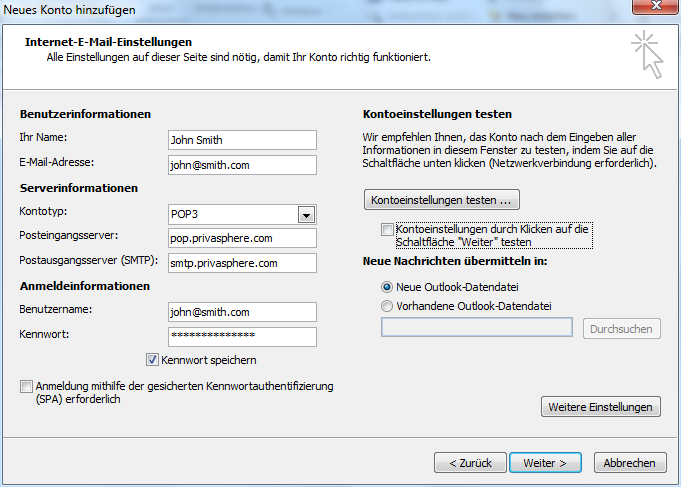 Note: Outlook 2016 has a new tutor since release of August 2017. It severely restricts the configuration of new individual accounts. 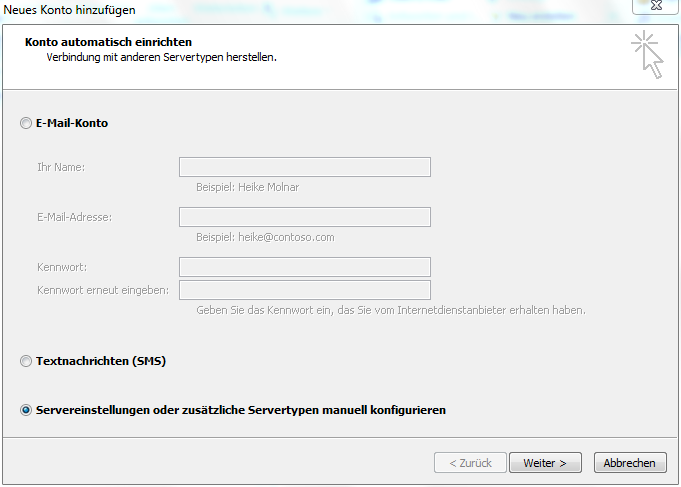 Use the "Windows System Control" -> "Mail" function for the configuration. 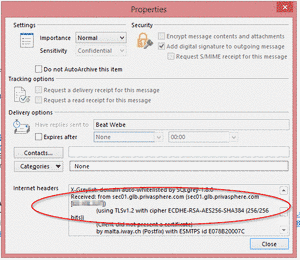 PrivaSphere Secure Messaging can also be integrated is scanners with mailing functonalities. Der Einsatz des AddIns erfolgt auf eigenes Risiko und ohne Gewähr. 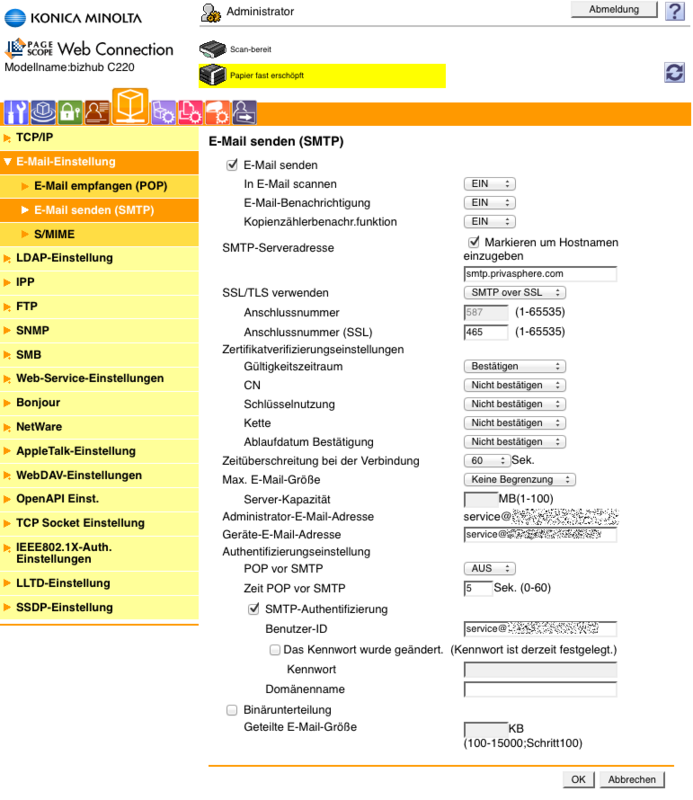 Die PrivaSphere AG und der Hersteller lehnen jede Haftung ab. 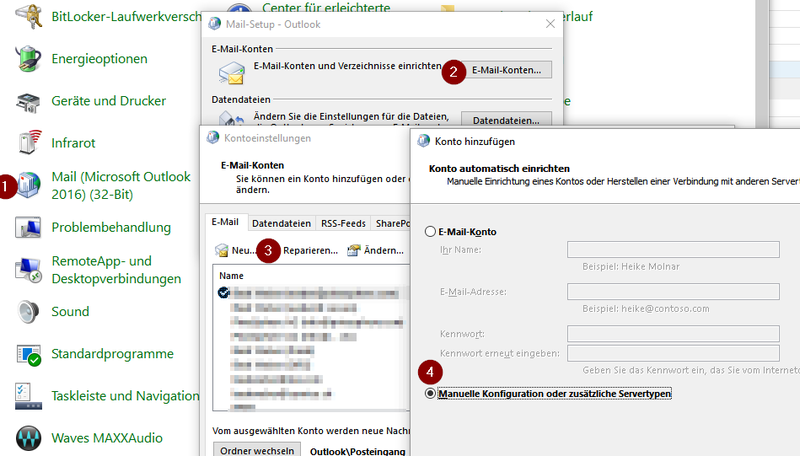 Andere Plugins für Lotus Notes und Thunderbird auf Anfrage. 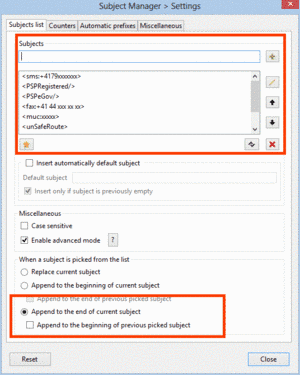 Subject Manager is a Thunderbird add-on which allows to manage subjects of emails. 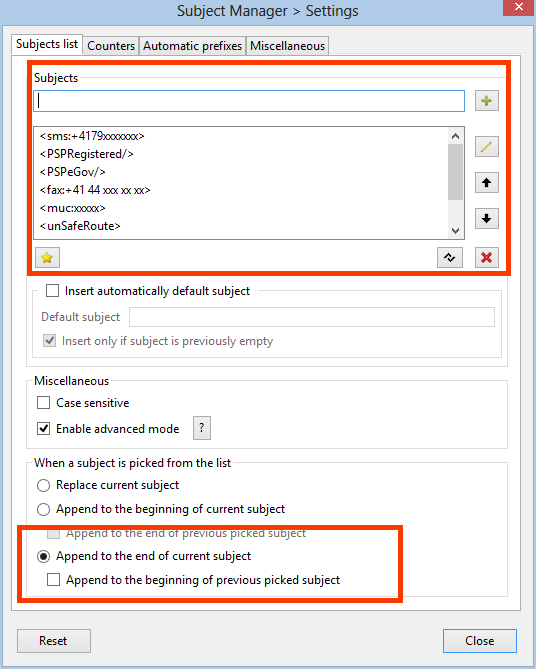 The main purpose is to store user-defined subjects and offer a convenient way to insert them into subject field. Just add the PrivaSphere Subject Tags as shown below. Mark: "Append to the end ..."
With PrivaSphere Secure Messaging all emails received can be delivered directly to the recipient’s inbox on its mail server. The decision whether PrivaSphere delivers the emails to the recipients servers is taken by the individual recipient. Precondition is a SSL certificate installed on the server that passes preliminary validity tests by the PrivaSphere platform.
! Please have only mails delivered to a ‘normal’ email server if you are sure that the security of your server meets your security requirements for confidential messages! PrivaSphere does not support this delivery service to free public mail services such as hotmail, gmx, gmail and others due to security reasons. If the user's email server presents a SSL certificate, PrivaSphere will ask the user to judge its appropriateness for delivery. This check is done for the first received email. 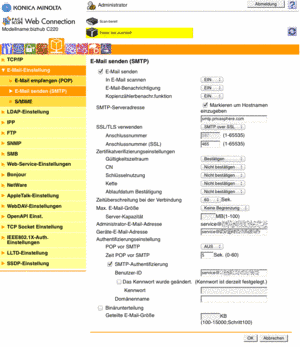 The certificate can be viewed in detail or downloaded as file. 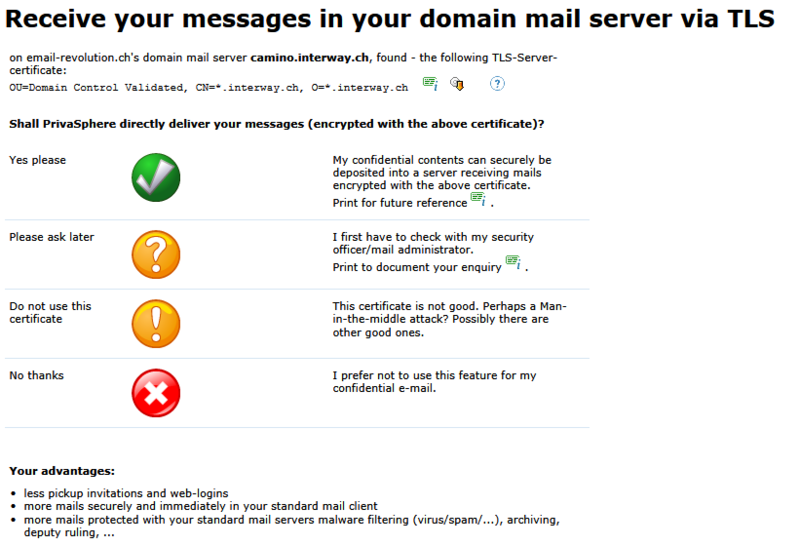 My confidential contents can securely be deposited into a server receiving mails encrypted with the above certificate. I first have to check with my security officer/mail administrator. This certificate is not good. Perhaps a Man-in-the-middle attack? Possibly there are other good ones. I prefer not to use this feature for my confidential e-mail. 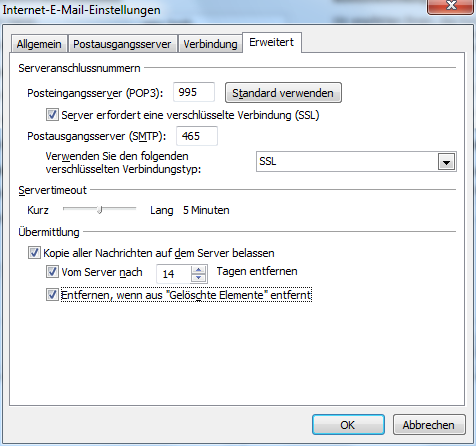 After acceptance you will find the setting in ‘My Account’ - ‘Domain mail server (TLS)’. Change the settings or switch the delivery service off. 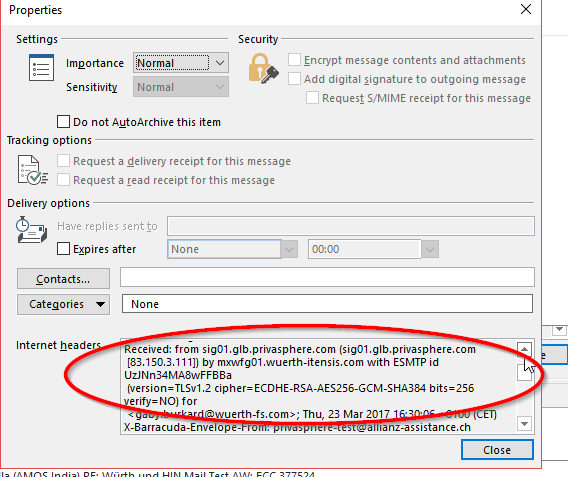 Make sure that your server is actual and does not send any attachments and message text back without encryption ("bounce") in case of malfunctions or errors. Unless confidentiality is also important for your relationship, it is advisable for the rare cases of internal faults of your mail server to not use bounces but use other alert mechanisms. 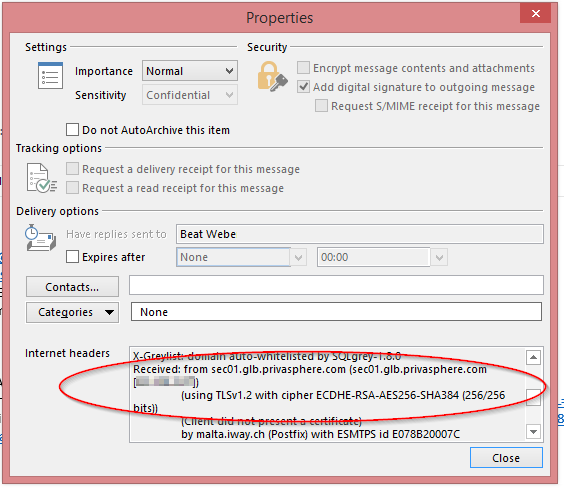 Size restrictions on internal redirectsPrivaSphere Secure Messaging delivers mail s up to the size your accepted 'forefront' mail server accepts. If you set up forwarding, you must ensure that the conditions the same (or larger) size restrictions. Otherwise, large emails are not delivered. 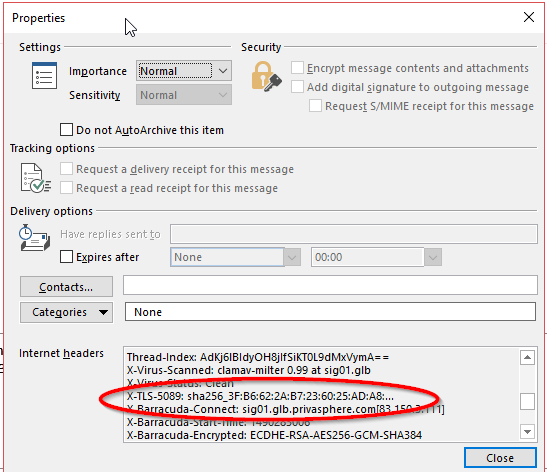 For the domain (with domain integration or asymmetric TLS) delivery or ‘NoStore’ delivery of messages PrivaSphere Secure Messaging checks the maximum size of accepted messages on the receiving server to facilitate the successful delivery. If the sent email is too big to be delivered it will be split to several partial mails which fit the server’s size restriction. Typically, each message share will contain the number of attachment that just still are likely to be accepted size-wise. If a single attached file is even too big on its own to be delivered in one message share, it will be split in several ZIP attachments each being put into a share. To put these files back together, the individual parts must be copied to a local directory to be subsequently assembled with a suitable program back together. Several ZIP programs can handle split, encrypted ZIP files (as WinZip, 7-Zip and others). 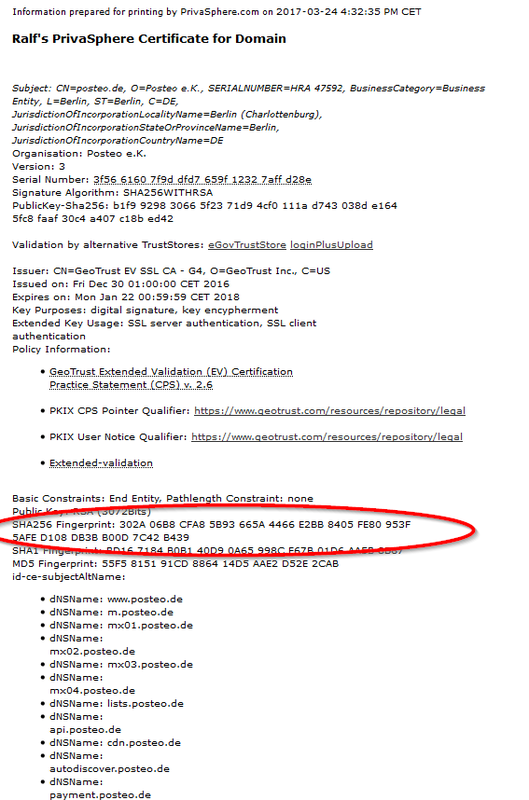 if you use the signature service already, you will be able to see whether the destination certificate was seen PrivaSphere earlier already ("opportunistic TLS" is default at PrivaSphere [see https://en.wikipedia.org/wiki/STARTTLS]). quite some domains have alternate domain names (e.g. SIX-group more than a dozen) - often they all use the same set of mail servers. With a few clicks, you only have to approve the TLS certificates once and define other domains as alias domains. Caveat: This service protects only the domain-to-domain relation. 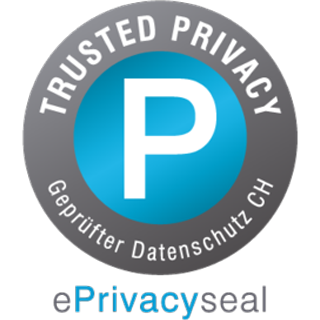 If you want to use the PrivaSphere value added services like 'misrouting protection' or initial authentication with MUC or eGov registered, you need to use the PrivaSphere main platform. It's possible to 'grandfather' TLS configurations from an old certificate to a new one.